Apple is conducting this year's big event of Worldwide Developer’s Conference 2012 (WWDC) at the Moscone Center in San Francisco, USA and everyone seems to be waiting for the big announcements, updates and official keynotes of all Apple's products at WWDC 2012. Apple's CEO Tim Cook has taken the stage on this morning to reveal the latest and big announcements in his company’s history, till yet we are getting all the updates live from WWDC arena from USA and keeping our readers and visitors updated with latest news and happening around Apple's WWDC 2012. Everyone knows that today is the big day for Apple's future and company is going to reveal some new and exciting products and features including iOS 6 for iPhone's, iPad's and iPod's in this event and will also introduce the new and upgraded Apple's MacBook Air and Apple's MacBook Pro with new and updated Apple's 3D Maps feature. Let me know you all the official keynotes, announcements and updates from Apple's WWDC 2012 arena. Till now Apple has announced and revealed the new Apple's iOS 6 for all of their products including iPhone, iPad and iPod products. 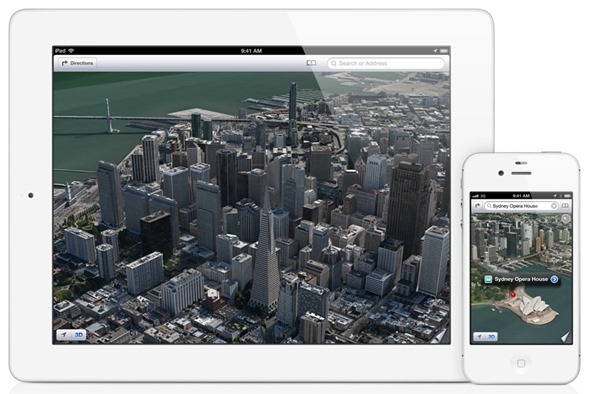 Apple has also introduced the new Apple’s own 3D Maps App which will replace Google Maps as standard and will soon be integrated in all latest iOS products. 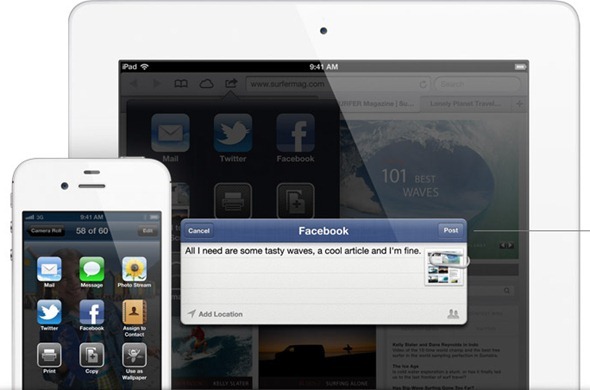 Another new feature which apple has revealed today is full Facebook integration with much improvement into the Apple's official Safari browser with the native application and the new updates for voice recognition agent Siri which will be fully compatible with iPad soon with the latest iOS 6 inclusion. Apple has also revealed and launched the new Apple's Mac OS X Mountain Lion Operating System for users at WWDC 2012. The Mountain Lion OS X has arrived just after 8 months of OS X Lion release, the operating system that attempted to join many best features of the iOS with best facilities of OS X with latest and updated features, software and hardware technology. 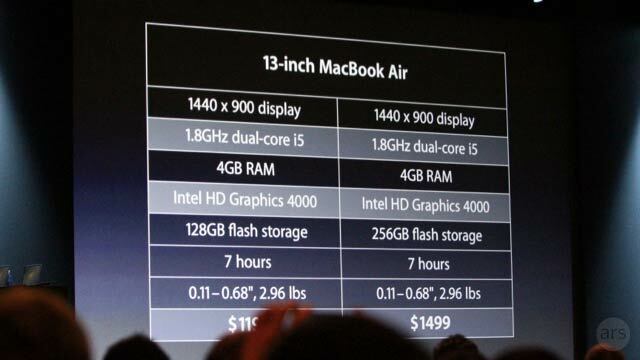 Another big announcement of today’s WWDC 2012 event is the new and upgraded Apple's MacBook Air and MacBook Pro systems. 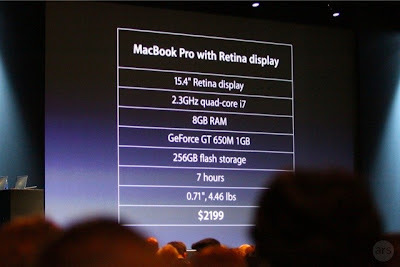 Apple has unveiled a new MacBook Pro featuring a thinner design and Retina display at its WWDC event today and Apple has also revealed the new MacBook Pro, as well as updates to its current MacBook Air and MacBook Pro models. You can get the full highlights, configuration and specification details of new MacBook Pro and MacBook Air models from the following image. Apple has officially launched and released the new iOS 6 Official Page on their website with in-depth feature details of iOS 6 after the successfully launched of WWDC 2012. 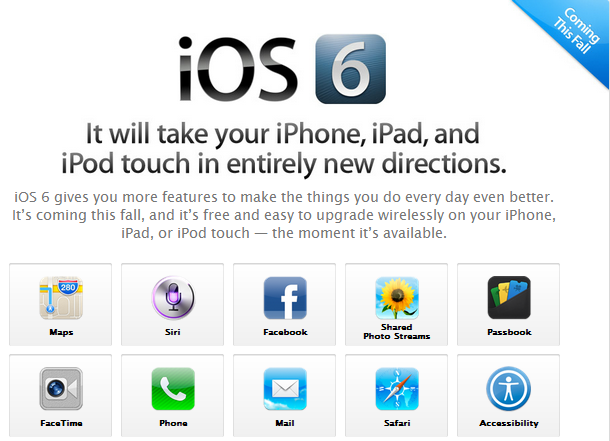 The official Page of iOS 6 is live on Apple's website; Click here if you want to see the magical page of iOS 6 which tells about key features of iOS 6. Somehow iOS 6 surely have much better features than the previous versions of Apple iOS. Apple has featured the native Facebook integration along with iOS 6 with Advanced SIRI feature, upgraded Safari browser and more than 200 new iOS features. 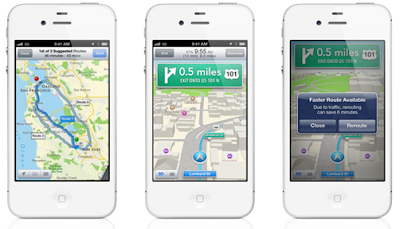 Official iOS 6 features can be found in following iOS 6 image and link. Official Apple iOS 6 beta version for all iOS devices is also available for download from here.